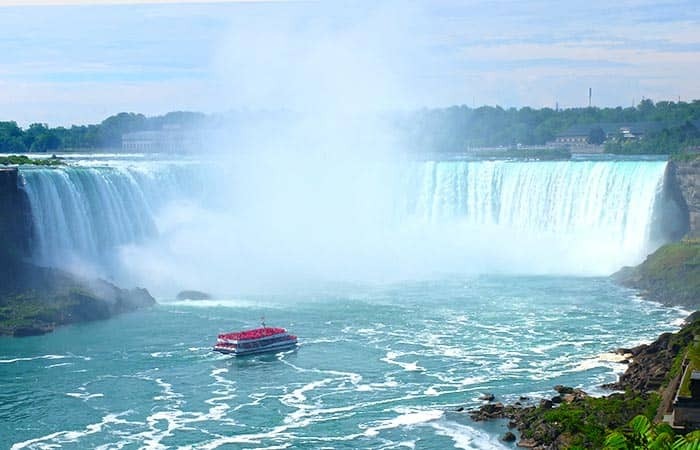 Travel from New York to Canada, Niagara Falls, Finger Lakes and New York State on a 3-day trip. See Lake Ontario and the 1000 islands too! You will meet at Gray Line Visitors Center at 07:00 and leave behind the rush of the city that never sleeps. The overnight accommodations as well as all the entrance fees are included in the price, you won’t need to think about a single thing – except enjoying yourself! From New York City you’ll head straight towards Watkins Glen, New York, where you’ll be able to marvel at the picturesque Finger Lakes. This little quiet town is at the base of Seneca Lake and gives you a preview of what you can expect a lot more of later: waterfalls. After enjoying the natural scenery of Watkins Glen National Park, you’ll continue on to see the most spectacular and famous waterfalls in the world – the Niagara Falls. You can tour the falls at night admiring the colourful display of lights in the water before you fall asleep in the comfortable Executive Inn Super 8 (or a similar hotel). The second day starts with breakfast at the hotel followed by enough time to marvel at the Niagara Falls once more. You will be able to take the Maid of the Mist boat tour where you travel so close to the falls that you get showered in their mist. This is only possible in the warmer months of May through October and if you are traveling outside of these months, you’ll be able to explore the falls from behind. 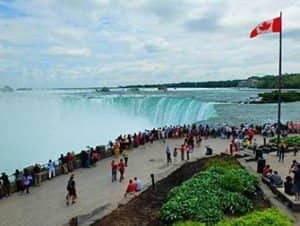 Afterwards you’ll head to Toronto (with a stop at the town Niagara on the Lake if weather permitting) and view the many sites the city has to offer. In the 4-5 hours of allocated time you can visit the CN Tower, City Hall, Parliament and Eaton Center. You will be able to dine at one of the local restaurants (at your own expense) before you head to the town of Gananoque for the night. On the last day you’ll take a boat tour down to the scenic St Lawrence River where you’ll be impressed by the beautiful 1000 Islands that straddle the border between the United States and Canada. When the weather is less permitting (typically in the months November – April) you will head to the Welland Canal Locks where ships are moved up and down the river. You will finish the day at the The Crossings Premium Outlets to find lots of designer and brand-name bargains. Note: All passengers must have the correct documentation to enter Canada. Do you have a Australian passport? Then there is no need to apply for a visa. As you’re travelling over land, you’re not required to obtain an eTA for Canada.